Roads, tunnels, and logistic provisions such as distribution centres have to be realised as efficiently as possible. At the same time, quality and safety remain of prime importance. After all, no government authority can afford a subsiding road. And a distribution centre that does not function optimally is a nightmare to the logistic service provider operating it. As a soil expert, ABT operates on an international scale and based on our in-depth technological knowledge and expertise we are able to design tunnels, floors, roads and bridges. The structures are not any heavier than necessary, ensuring maximum cost-effectiveness while maintaining constructive room for the creation of attractive, slender spans. During the period 2010-2014, ABT was involved in the renovation and expansion of fourteen engineering works. 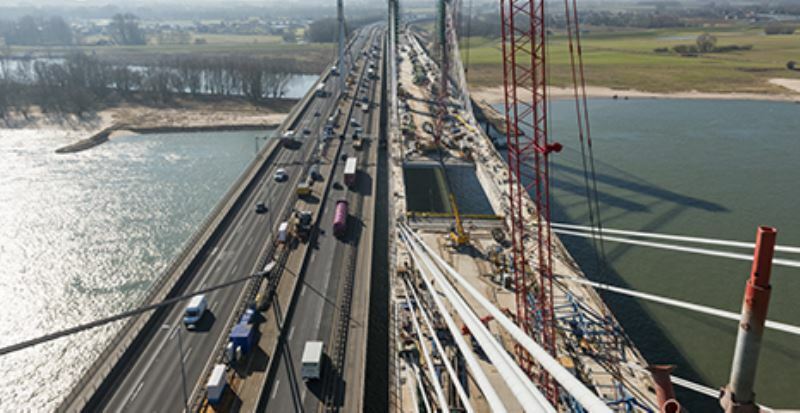 For the new Waalbrug (Tacitus bridge) near Ewijk-Valburg, the Netherlands, we were responsible for a number of aspects, including the foundation and the substructure.